This apple cake is super easy, full of cinnamon and apples and is topped off with a simple salted caramel frosting. With gluten-free, 100% whole grain and all-purpose flour options. Just a little warning – this isn’t healthy in any shape or form. No need to send me nasty emails about it, though. ;) If you’d like something a little healthier, I highly recommend these paleo apple muffins or these whole wheat apple muffins. There’s actually more sugar than flour in this apple cake. Yup. You could reduce it by a little and I’m pretty sure it’d still be plenty sweet and moist. There’s also a ton of oil. If you want, I think that could be reduced by a tablespoon or two. But I wouldn’t go cutting it in half! Only as I’m writing this did I think about using half applesauce / half oil. That sounds like it could work and obviously the cake wouldn’t be hurt by the addition of more apple flavor. The cake is actually a lot moister than you can tell just by looking at the pictures. I’m not quite sure why that is. Lighting? My photography skills? Who knows. 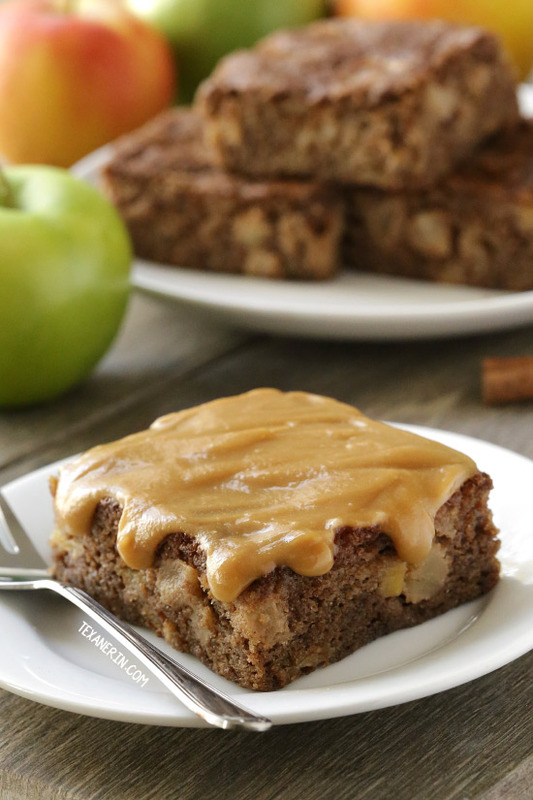 You can use whole wheat flour, a blend of gluten-free flours (listed in the recipe) or even all-purpose flour in this caramel apple cake. I’ve tested them all! I probably wouldn’t recommend whole spelt unless you reduce the oil by a tablespoon or so. The cake itself is dairy-free but the frosting isn’t. If you need a dairy-free frosting, I’m thinking this vegan cream cheese frosting would be great on this cake! The frosting in this recipe is the same one I used in my caramel apple cheesecake bars. It’s so easy! I don’t like complicated caramel recipes because really – I’m destined to ruin it. If you’re a capable caramel maker, I bet this cake would be awesome together with some vanilla ice cream. If you want to try an apple cake that’s a little different, you have to try my upside down apple honey cake! It’s gotten rave reviews and is one of my very favorite recipes. And if you want to make this in bundt form, I have to say I have no idea how it’d work out. I’d recommend giving this caramel apple bundt cake from Shugary Sweets a shot! It looks great. Preheat the oven to 350 °F. Line a 9" x 13" baking pan with a piece of parchment paper or alternatively spray the pan with baking spray. In a large mixing bowl, stir together the brown sugar, granulated sugar, oil, eggs and vanilla until thoroughly combined. Add in the flour mixture and mix just until well combined. Pour the batter into the prepared pan and bake for 33-40 minutes or until a toothpick inserted in the center comes out clean. Let cool completely before frosting. Prepare the frosting. Melt the butter in a medium saucepan over medium heat. Stir in the brown sugar and whipping cream. Once the mixture starts bubbling, stop stirring. Let the mixture come to a full boil and boil for 1 minute without stirring. Remove the pan from the heat. Stir in the vanilla, 1/4 teaspoon salt, and gradually add the powdered sugar. Whisk until the powdered sugar is fully incorporated and no lumps of sugar remain. Add the remaining 1/4 teaspoon salt, if desired. Once the cake has cooled, spread the frosting over the top and refrigerate any leftovers for up to 4 days. Let come to room temperature before serving. 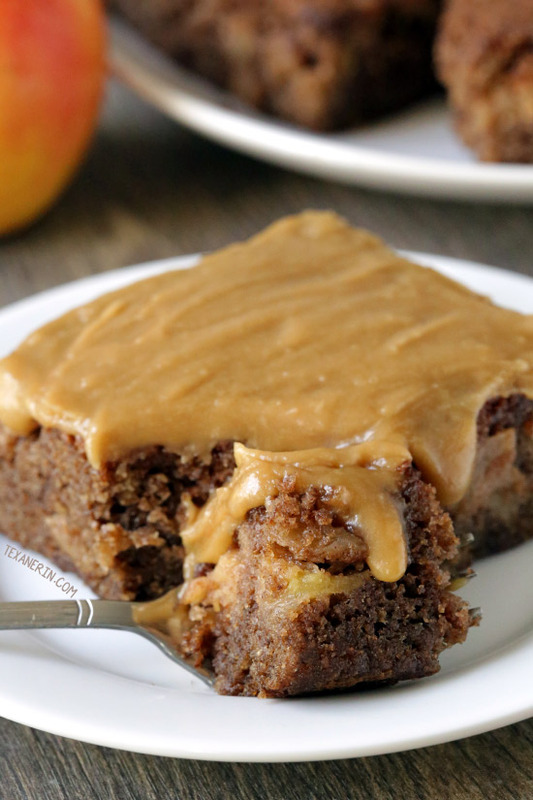 50 comments on “Apple Cake with Easy Caramel Frosting (gluten-free option)” — Add one! This cake is amazing. I used Bob’s 1:1 gluten free flour. I reduced regular sugar to 1/2 cup. Replaced half the oil with unsweetened applesauce. Cake is very moist and flavorful. Thanks for the recipe! Don’t worry I won’t email you about the added sugar and flour to this recipe :) I will however tell you how amazing it looks and how much I adore all that apple flavor. This baby looks perfect! I adore apple cake, it’s SO good. This looks seriously scrumptious. And that caramel, oh my, I love a good caramel sauce. Same here! I love the cake but the caramel?! Oh my gosh. I think your cake looks very moist…and that caramel frosting on top doesn’t hurt either. Delicious! I’m pretty sure that I could eat that topping with a spoon! Love the idea of using the applesauce in place of the oil! Haha. Yup. I usually do! What a cake! This is another time where I wish I could reach into my computer monitor and grab a piece! Cannot wait to make this cake with apples from my daughter’s tree! Looks lovely! Thank you! That sounds amazing! I wish I had some relatives with apples trees. ;) I hope you’ll enjoy the cake! Oh man, that topping!! I don’t care if it’s not healthy, I still want a big slice. that caramel is too die for! I’m sending you a nasty email right NOW hahaha Kidding! I love this cake – it looks simply mouth-watering!! I personally LOVE this cake! Life is about moderation. We should be able to enjoy sweets in moderation too and I would choose this cake in a heart beat! Tis the season for sugar right? hehe Anything apple this time of year and I’m game! This sounds incredible, Erin! I’m swooning over that dripping caramel glaze. 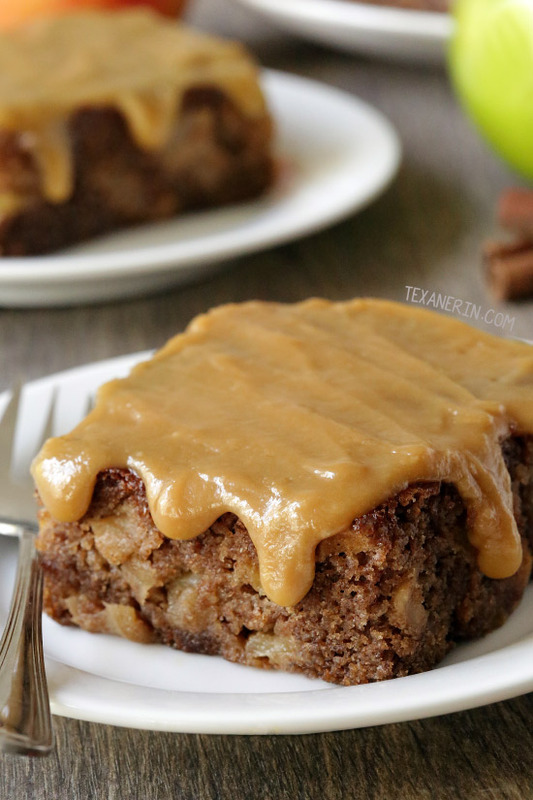 Apple cakes are my fave and this one I’ve got to try! What a yummy recipe! Can’t wait to try this! This cake looks amazing, and that caramel frosting is the perfect finish for it! :) Yum! This looks heavenly! So dense and moist! It looks very moist to me. Wish I had a piece right now. HA!! That caramel frosting Erin – TO DIE FOR! This cakes looks perfect! Have mercy! Your apple cake looks fabulous, Erin. I agree…apple cake recipes, like carrot cake and pumpkin cake recipes, shouldn’t be messed with too much…at least if you want something that is decadent and moist as a treat. Love the caramel topping! Thanks for sharing and…Happy Thanksgiving! Hubba hubba! Be still my caramel apple loving heart!